Lord Shiva manifested in the form of Jyotirlingam or the cosmic light. 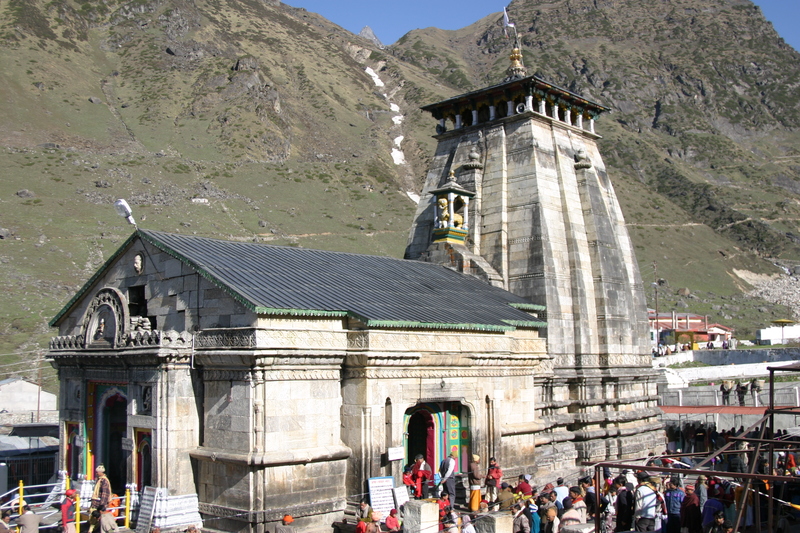 Kedarnath is highest among the 12 Jyotirlingas. This ancient and magnificient temple is located in the Rudra Himalaya range. This temple, over a thousand years old is built of massive stone slabs over a large rectangular platform. Ascending through the large gray steps leading to the holy sanctums we find inscriptions in Pali on the steps. The present temple was built by Adi Shankaracharya.The inner walls of the temple sanctum are adorned with figures of various deities and scenes from mythology. The origin of the revered temple can be found in the great epic - Mahabharata. According to legends, the Pandavas sought the blessings of lord Shiva to atone their sin after the battle of Mahabharata. Lord Shiva eluded them repeatedly and while fleeing took refuge at Kedarnath in the form of a bull. On being followed, he dived into ground leaving behind his hump on the surface. Outside the temple door a large statue of the Nandi Bull stands as guard. A conical rock formation inside the temple is worshipped as Lord Shiva in his Sadashiva form. The temple, believed to be very ancient, has been continually renovated over the centuries. It is situated at an altitude of 3,581 mt. It is a 14 km trek from Gaurikund. Best Time to visit:- The ideal time or peak season to go for a Char Dham Yatra is from May to October, except monsoons. This is because; all the four sacred sites are perched in Garhwal Himalayas, which is prone to heavy snowfall. As a result, all the passage leading to the shrines are blocked. Moreover, during the monsoon season, there is undue threat of having landslides, which can further disrupt the journey. For safety reasons, the gates of the temples are also closed for this period of time and the idols are shifted to nearby pilgrim points. Air - Jolly grant (Dehradunl239 km away from Kedamath of which 225 km is by road and rest 14 km is on foot. Chopper service available from Agastyamuni 158km from Rishikesh & Kedarnath. Chartered services available from Delhi - Saraswa or Jolly Grants to Kedarnath, Badarinath. Rail- Railhead at Rishikesh, 221 km away of which 207 km is by road and the rest 14 km is on foot. Railhead at Kotdwara, 250 km away, of which 236 km is by road and rest 14 km is on foot. Road - Kedarnath is approachable on foot from Gaurikund, which is connected by road with Rishikesh, Kotdwara, Dehradun, Haridwar and other important hill stations of Garhwai and Kumaon Hills. Bus -This service is available at Rishikesh, Haridwar and Kotdwara for Gaurikund. During Yatra season, some special Yatra services are also arranged to Gaurikund. Distance from Rishikesh to Kedamath 223 km, via Deoprayag 70 km, Shrinagar 35 km, Rudraprayag 34 km, Tilwara 9 km, Agastyamuni 10 km, Kund 15 km, Guptkashi 5 km, Fata 1 1 km, Rampur 9 km, Sonprayag 3 km Gaurikund 5 km, Rambara 7 km, Garurchatti 4 km, Sri Kedarnath 3 km. Transport : Buses, private taxies and other lightvehicles also ply between Rishikesh and Gaurikund-Badarinath and back. The charges are not fixed. Horses, Dandies and Ponies are available at Gaurikund for going and carrying luggage to Kedarnath. Kapat Opening:- The kapat of Shri Kedarnath Temple will open on 18th May 2010.